Sponsored by the Episcopal Church Women of Calvary and St. Luke's Episcopal Churches to support their outreach programs including Backpack Buddies at W. A. Patillo School. White Elephant Sale, Cake Raffle, Pantry Sale (frozen casseroles, baked goods, pickles/preserves), and Vendors. Each plate contains homemade chicken, broccoli, and pasta salads plus dessert and beverage. Enjoy table service in the festive dining room or take out your order. Note that this date is a week earlier than the traditional date for the luncheon!! White Elephant Sale opens at 9 am in Jenkins Parlor. Libby Whitehurst (252) 824-6682; lbw2550@embarqmail.com or Anna Ryals Aycock (252) 450-5538; annaryals.aycock@gmail.com or Calvary Church Office (252) 823-8192; open Monday-Thursday from 7:30 am until 2 pm and 7:30 until 11:30 am on Friday. $8/plate. Tickets must be purchased in advance as only 350 will be printed and plates prepared. You may purchase tickets from any ECW member or from contacts listed above. 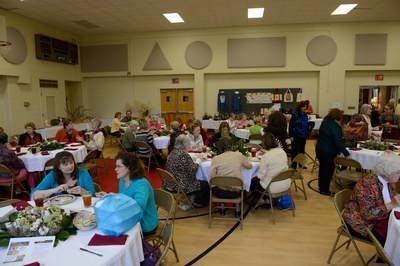 You do not need a luncheon ticket to shop the White Elephants, Pantry, and Vendors.